Henry Howard, earl of Surrey, was the eldest son of Thomas, the third duke of Norfolk, lord high treasurer of England in the reign of Henry VIII. by Elizabeth, daughter of Edward Stafford, duke of Buckingham. He was born either at his father’s seat at Framlingham, in Suffolk, or in the city of Westminster, and being a child of great hopes, all imaginable care was taken of his education. When he was very young he was companion, at Windsor castle, with Henry Fitzroy, duke of Richmond, natural | son to Henry VIII. and afterwards student in Cardinal college, now Christ Church, Oxford. In 1532 he was with the duke of Richmond at Paris, and continued there for some time in the prosecution of his studies, and learning the French language; and upon the death of that duke in July 1536, travelled into Germany, where he resided some time at the emperor’s court, and thence went to Florence, where he fell in love with the fair Geraldine, the great object of his poetical addresses, and in the grand duke’s court published a challenge against all who should dispute her beauty; which challenge being accepted, he came oft victorious. For this approved valour, the duke of Florence made him large offers to stay with him; but he refused them because he intended to defend the honour of his Geraldine in all the chief cities of Italy. But this design of his was diverted by letters sent to him by king Henry VIII. recalling him to England. He left Italy, therefore, where he had cultivated his poetical genius by the reading of the greatest writers of that country, and returned to his own country, where he was considered a one of the first of the English nobility, who adorned his high birth with the advantages of a polite taste and extensive literature. On the first of May, 1540, he was one of the chief of those who justed at Westminster, as a defendant, against sir John Dudley, sir Thomas Seymour, and other challengers, where he behaved himself with admirable courage, and great skill in the use of his arms, and, in 1542, served in the army, of which his father was lieutenant-genera!, and which, in October that year, entered Scotland, and burnt divers villages. In February or March following, he was confined to Windsor castle for eating flesh in Lent, contrary to the king’s proclamation of the 9th of February 1542. In 1544, upon the expedition to Boulogne, in France, he was field-marshal of the English army; and after taking that town, being then knight of the garter, he was in the beginning of September 1545, constituted the king’s lieutenant and captain-general of all his army within the town and country of Boulogne. During his command there in 1546, hearing that a convoy of provisions of the enemy was coming to the fort at Oultreau, he resolved to intercept it; but the Rhingrave, with‘ four thdusand Lanskinets, together with a considerable number of French under the marshal de Blez, making an obstinate defence, the Englisii were routed, anil sir | Edward Poynings, with divers other gentlemen, killed, and the earl of Surrey himself obliged to fly; though it appears by a letter of his to the king, dated January 8, 1545-6, that this advantage cost the enemy a great number of men. But the king was so highly displeased with this ill success, that, from that time he contracted a prejudice against the earl, and, soon after, removed him from his command, appointing the earl of Hertford to succeed him. On this sir William Paget wrote to the earl of Surrey to advise him to procure some eminent post under the earl of Hertford, that he might not be unprovided in the town and field. The earl being desirous, in the mean time, to regain his former favour with the king, skirmished against the French, and routed them; but, soon after, writing over to the king’s council, that as the enemy had cast much larger cannon than had been yet seen, with which they imagined they should soon demolish Boulogne, it deserved consideration, whether the lower town should stand, as not being defensible, the council ordered him to return to England, in order to represent his sentiments more fully upon those points, and the earl of Hertford was immediately sent over in his room. This exasperating the earl of Surrey, occasioned him to let fall some expressions which savoured of revenge, and a dislike of the king, and an hatred of his counsellors; and was, probably, one great cause of his ruin soon after. His father, the duke of Norfolk, had endeavoured to ally himaelf to the earl of Hertford, and to his brother, sir Thomas Seymour, perceiving how much they were in the king’s favour, and how great an interest they were likely to have under the succeeding prince; and therefore he would have engaged his son, being then a widower (having lost his wife Frances, daughter of John earl of Oxford), to marry the earl of Hertford’s daughter, and pressed his daughter, the duchess of Richmond, widow of the king’s natural son, to marry sir Thomas Seymour. But though the earl of Surrey advised his sister to the marriage projected for her, yet he would nol consent to that designed for himself; nor did the proposition about himself take effect. 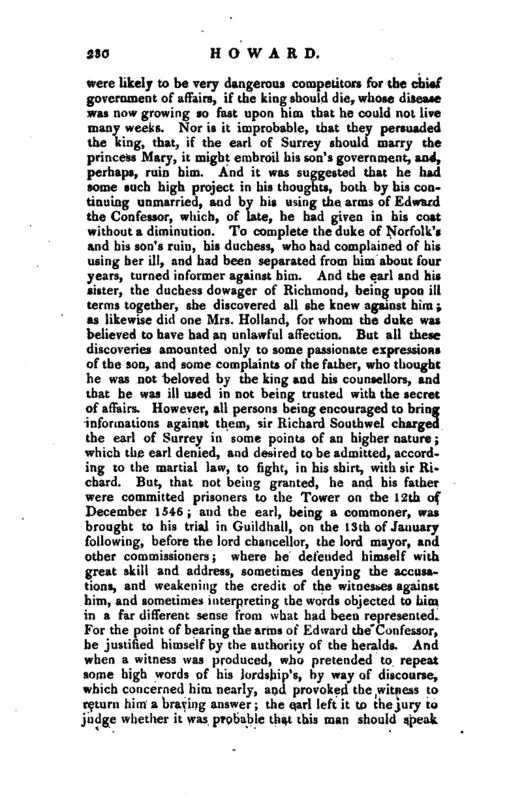 The Seymours could not but perceive the enmity which the earl bore them; and they might well be jealous of the greatness of the Howard family, which was not only too considerable for subjects, of itself, but was raised so high by the dependence of th whole popish party, both at home and abroad, that they | were likely to be very dangerous competitors for the chief government of affairs, if the king should die, whose disease was now growing so fast upon him that he could not live many weeks. Nor is it improbable, that they persuaded the king, that, if the earl of Surrey should marry the princess Mary, it might embroil his son’s government, and, perhaps, ruin him. And it was suggested that he had some such high project in his thoughts, both by his continuing unmarried, and by his using the arms of Edward the Confessor, which, of late, he had given in his coat without a diminution. To complete the duke of Norfolk’s and his son’s ruin, his duchess, who had complained of his using her ill, and had been separated from him about four years, turned informer against him. And the earl and his sister, the duchess dowager of Richmond, being upon ill terms together, she discovered all she knew against him; as likewise did one Mrs. Holland, for whom the duke was believed to have had an unlawful affection. But all these discoveries amounted only to some passionate expressions of the son, and some complaints of the father, who thought he was not beloved by the king and his counsellors, and that he was ill used in not being trusted with the secret of affairs. However, all persons being encouraged to bring informations against them, sir Richard Southwel charged the earl of Surrey in some points of an higher nature; which the earl denied, and desired to be admitted, according to the martial law, to fight, in his shirt, with sir Richard. But, that not being granted, he and his father were committed prisoners to the Tower on the 12th of December 1546; and the earl, being a commoner, was brought to his trial in Guildhall, on the 13th of January following, Jbefore the lord chancellor, the lord mayor, and other commissioners; where he defended himself with great skill and address, sometimes denying the accusations, and weakening the credit of the witnesses against him, and sometimes interpreting the words objected to him in a far different sense from what had been represented. For the point of bearing the arms of Edward the Confessor, he justified himself by the authority of the heralds. And when a witness was produced, who pretended to repeat some high words of his lordship’s, by way of discourse, which concerned him nearly, and provoked the witness to return him a braving answer; the qarl left it to the jury to judge whether it was probable that this man should speak | thus to him, and he not strike him again. In conclusion, he insisted upon his innocence, but was found guilty, and had sentence of death passed upon him. He was beheaded on Tower-hill on the 19th of January 1546-7; and his body interred in the church of All Hallows Barking, and afterwards removed to Framlingham, in Suffolk. and the duke of Richmond natural son to Henry the Seventh. 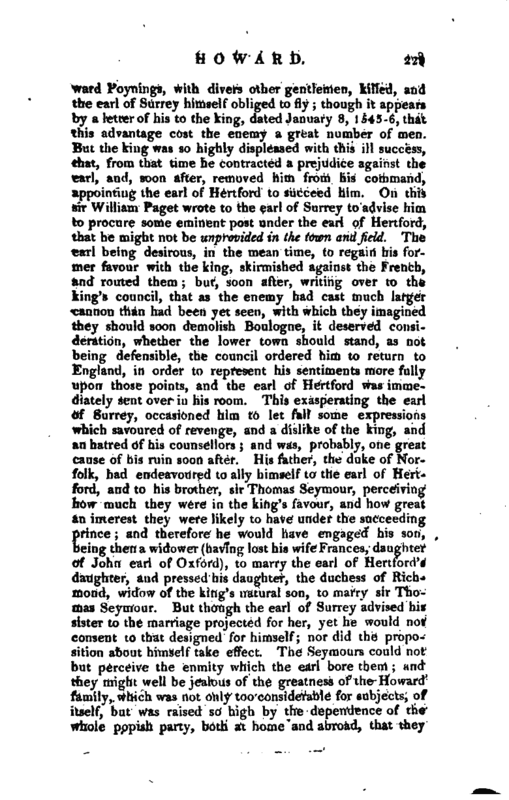 His next biographer to whom any respect is due was the late earl of Orford, in his Catalogue of “Royal and Noble Authors.” The account of Surrey, in this work, derives its chief merit from lord Orford’s ingenious explanation of the sonnet on Geraldine, which amounts to this, that Geraldine was Elizabeth (second daughter of Gerald Fitzgerald earl of Kildare), and afterwards third wife of Edward Clinton earl of Lincoln; and that Surrey probably saw her first at Hunsdon-house in Hertfordshire, where, as she was second cousin to the princesses Mary and Elizabeth, who were educated in this place, she might have been educated with them, and Surrey, as the companion of the duke of Richmond, the king’s natural son, might have had interviews with her, when the duke went to visit his sisters. All this is ingenious; but no light is thrown upon the personal history of the earl, and none of the difficulties, however obvious, in his courtship of Geraldine removed, or even hinted at; nor does lord Orford condescend to inquire into the dates of any event in his life. 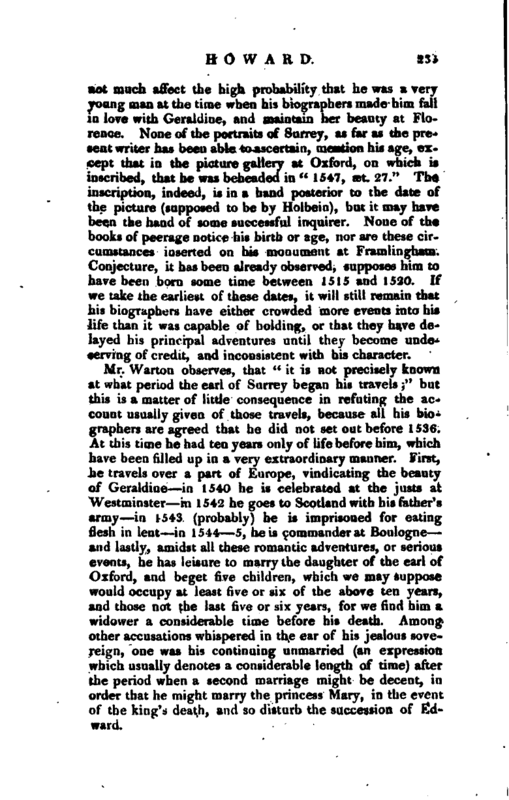 After adopting lord Orford’s explanation of the sonnet on Geraidine, Mr. Warton proceeds to Surrey’s travels, beginning with a circumstance on which much more attention ought to have been bestowed. "It is not precisely known at what period the earl of Surrey began his travels. They have the air of a romance. He made the tour of Europe in the true spirit of chivalry, and with the ideas of an Amadis: proclaiming the unparalleled charms of his mistress, and prepared to defend the cause of her beauty with the weapons of knight-errantry. Nor was this adventurous journey performed without the intervention of an enchanter. The first city in Italy which he proposed to visit was Florence, the capital of Tuscany, and the original seat of the ancestors of his Geraidine. In his way thither, he passed a few days at the emperor’s court ^ where he became acquainted with Cornelius Agrippa, a celebrated adept in natural magic. This visionary philosopher shewed our hero, in a mirror of glass, a living image of Geraidine, reclining on a couch, sick, and reading one of his most tender sonnets by a waxen taper. His imagination, which wanted not the flattering F represeniations and artificial incentives of illusion, was heated anew by this interesting and affecting spectacle. Inflamed wiih every enthusiasm of the most romantic passion, he hastened to Florence and on his arrival, immediately published a defiance against any person who could handle a | lance and was in love, whether Christian, Jew, Turk, Saracen, or Canibal, who should presume to dispute the superiority of Geraldine’s beauty. As the lady was pretended to be of Tuscan extraction, the pride of the Flo-, rentines was flattered on this occasion: and the grand duke of Tuscany permitted a general and unmolested ingress into his dominions of the combatants of all countries, till this important trial should be decided. The challenge was accepted, and the earl victorious. The shield which he presented to the duke before the tournament began, is exhibited in Vertue’s valuable plate of the Arundel family, and was actually in the possession of the late duke of Norfolk. 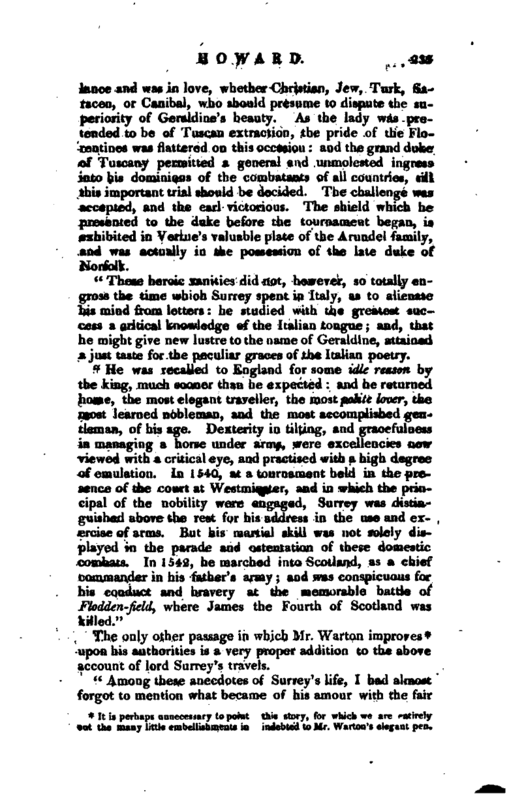 _*’ These heroic vanities did not, however, so totally engross the time which Surrey spent in Italy, as to alienate his mind from letters: he studied with the greatest success a critical knowledge of the Italian tongue; and, that he might give new lustre to the name of Geraldine, attained a just taste for the peculiar graces of the Italian poetry. It is perhaps unnecessary to point out the many little embellishments in this story, for which, we are entirely indebted to Mr. Warton’s elegant pen. 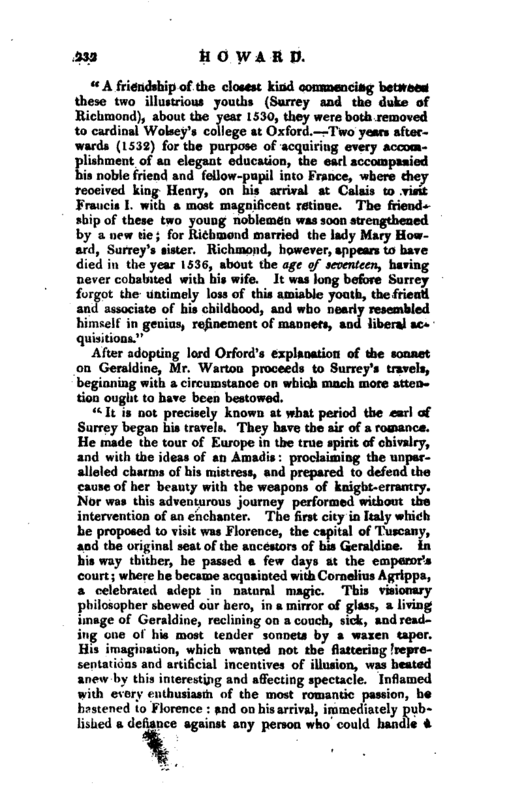 upon his authorities is a very proper addition to the above account of lord Surrey’s travels. 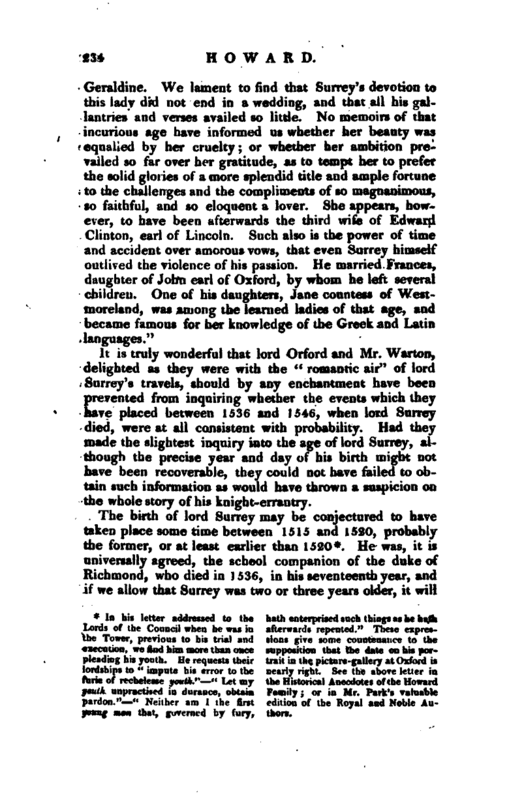 It is truly wonderful that lord Orford and Mr. Warton, delighted as they were with the “romantic air” of lord Surrey’s travels, should by any enchantment have been prevented from inquiring whether the events which they have placed between 1536 and 1546, when lord Surrey died, were at all consistent with probability. 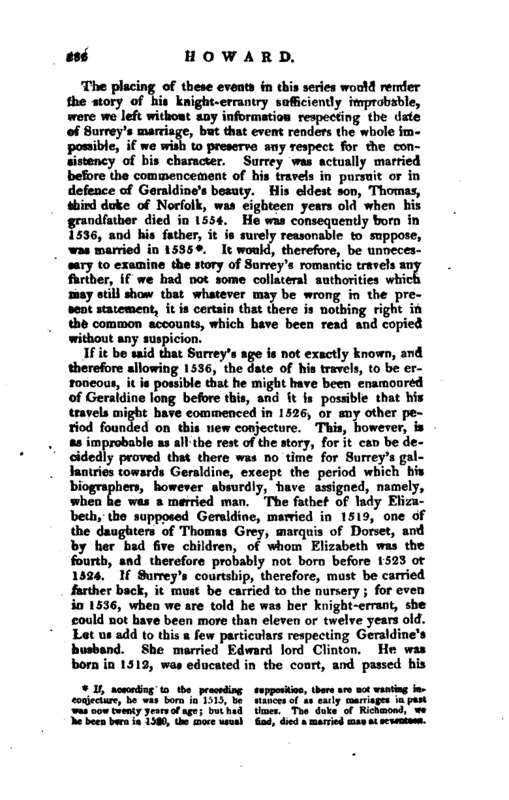 Had they made the slightest inquiry into the age of lord Surrey, although the precise year and day of his birth might not have been recoverable, they could not have failed to obtain such information as would have thrown a suspicion on the whole story of his knight-errantry. In his letter addressed to the Lords of the Council when he was in the Tower, previous to his trial and execution, we find him more than once pleading his youth. He requests their lordships to “impute his error to the furie of recbelesse youth.” “Let my youth unpractised in durance, obtain pardon.” “Neither am I the first young rn*K that, governed by fury, hath enterprised such things as he hath afterwards repented.” These expressions give some countenance to the supposition that the date on his portrait in the picture-gallery at Oxford is nearly right. See the above letter in the Historical Anecdotes of the Howard Family; or in Mr. Park’s valuable edition of the Royal and Noble Authors. 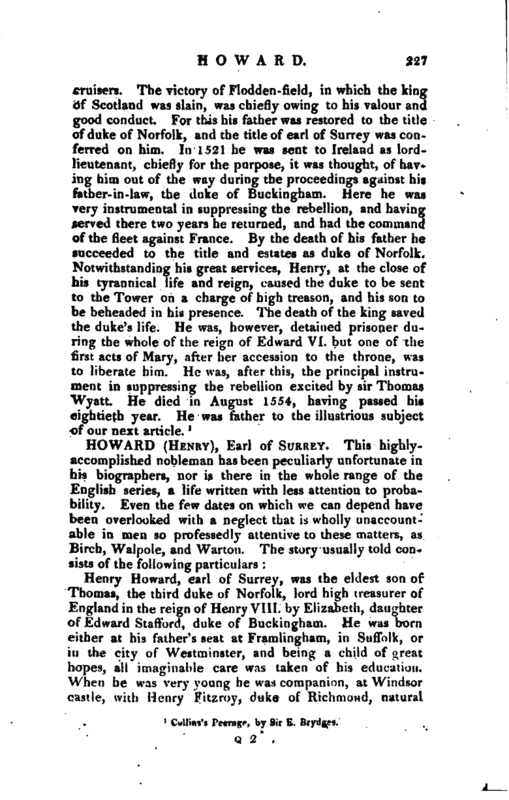 He was, it is, universally agreed, the school companion of the duke of Richmond, who died in 1536, in his seventeenth year, and if we allow that Surrey was two or three years older, it will | not much affect the high probability that he was a very young man at the time when his biographers made him fall in love with Geraldine, and maintain her beauty at Florence. None of the portraits of Surrey, as far as the present writer has been able to ascertain, mention his age, except that in the picture gallery at Oxford, on which is inscribed, that he was beheaded in “1547, set. 27.” The inscription, indeed, is in a hand posterior to the date of the picture (supposed to be by Holbein), but it may have been the hand of some successful inquirer. None of the books of peerage notice his birth or age, nor are these circumstances inserted on his monument at Framlingham. Conjecture, it has been already observed, supposes him to have been born some time between 1515 and 1520. If we take the earliest of these dates, it will still remain that his biographers have either crowded more events into his life than it was capable of holding, or that they have delayed his principal adventures until they become undeserving of credit, and inconsistent with his character. If, according to the preceding conjecture, he was born in 1515, he was now twenty years of age; but had he been born in 1520, the more usual supposition, there are not wanting instances of as early marriages in past times. The duke of Richmond, we find, died a married man at seventeen. 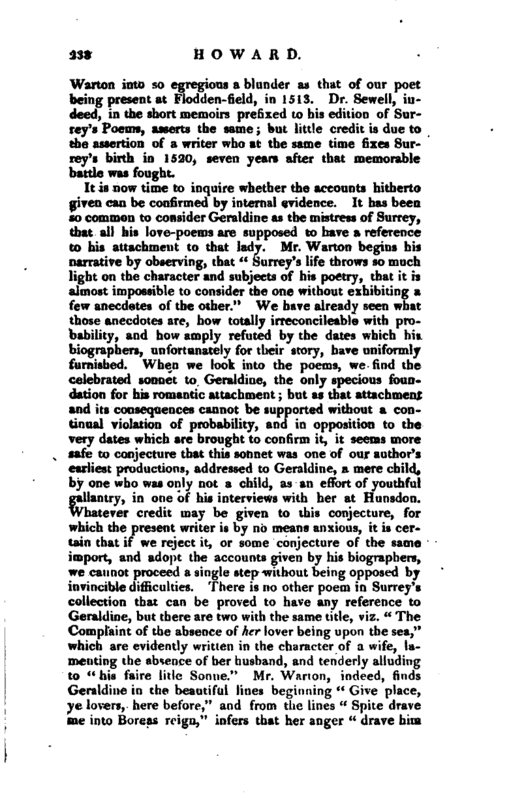 It would, therefore, be unnecessary to examine the story of Surrey’s romantic travels any farther, if we had not some collateral authorities which may still show that whatever may be wrong in the present statement, it is certain that there is nothing right in the common accounts, which have been read and copied without any suspicion. See Drayton’s Works, vol. IV. p.- 96, et seqq. which led Mr. | Warton into so egregious a blunder as that of our poet being present at Flodden-field, in 1513. 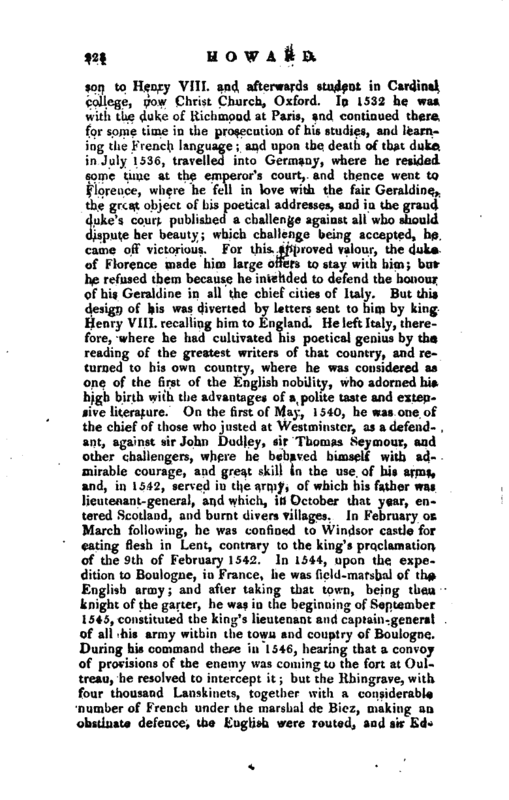 Dr. Sewell, indeed, in the short memoirs prefixed to his edition of Surrey’s Poems, asserts the same; tut little credit is due to the assertion -of a writer who at the same time fixes Surrey’s birth in 1520, seven years after that memorable battle was fought. It is now time to inquire whether the accounts hitherto given can be confirmed by internal evidence. 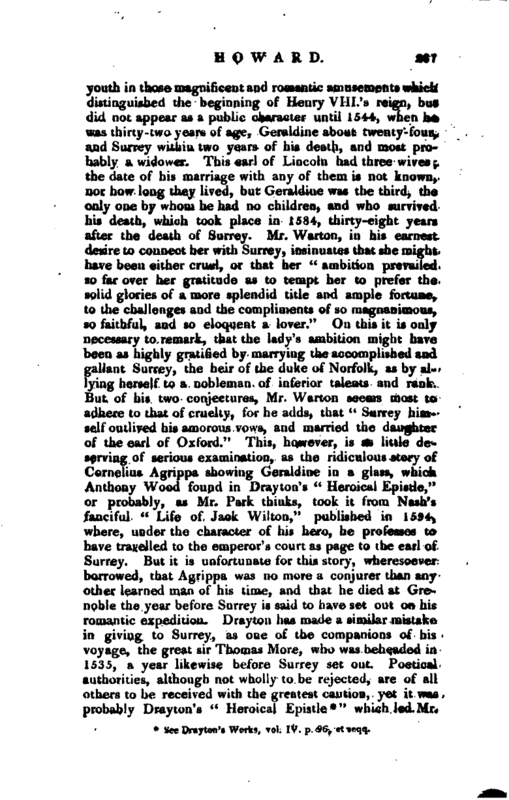 It has been so common to consider Geraldine as the mistress of Surrey, that all his love-poems are supposed to have a reference to his attachment to that lady. 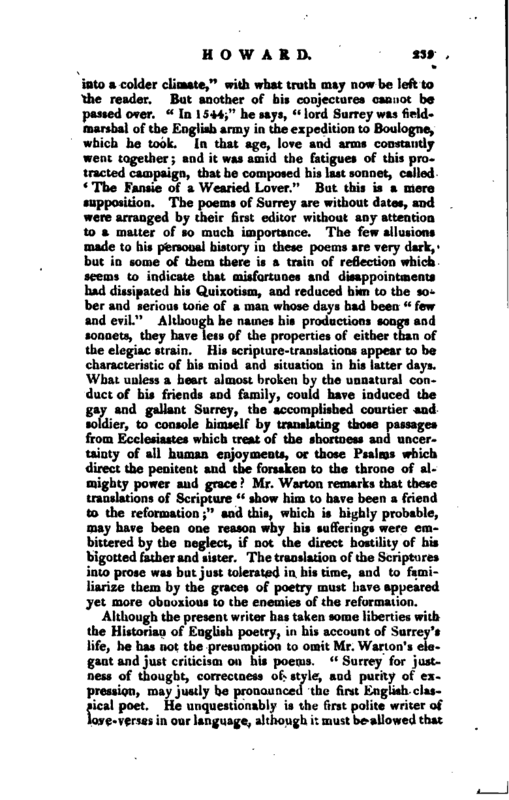 Mr. Warton begins his narrative by observing, that “Surrey’s life throws so much light on the character and subjects of his poetry, that it is almost impossible to consider the one without exhibiting a few anecdtes of the other.” We have already seen what those anecdotes are, how totally* irreconcileable with probability, and how amply refuted by the dates which hi biographers, unfortunately for their story, have uniformly furnished. When we look into the poems, we find the celebrated sonnet to Geraldine, the only specious foundation for his romantic attachment; but as that attachment and its consequences cannot be supported without a continual violation of probability, and in opposition to the very dates which are brought to confirm it, it seems more safe to conjecture that this sonnet was one of our author’s earliest productions, addressed to Geraldine, a mere child, by one who was only not a child, as an effort of youthful gallantry, in one of his interviews with her at Hunsdon. Whatever credit may be given to this conjecture, for which the present writer is by no means anxious, it is certain that if we reject it, or some conjecture of the same import, and adopt the accounts given by his biographers, we cannot proceed a single step without being opposed by invincible difficulties. There is no other poem in Surrey’s collection that can be proved to have any reference to Geraldine, but there are two with the same title, viz. “The Complaint of the absence of her lover being upon the sea,” which are evidently written in the character of a wife, lamenting the absence of her husband, and tenderly alluding to “his faire litle Sonne.” Mr. Wanon, indeed, finds Geraldine in the beautiful lines beginning “Give place, ye lovers, here before,” and from the lines “Spite drave me into Boreas reign,” infers that her anger “drave him | into a colder climate,” with what truth may now be left to the reader. But another of his conjectures cannot be passed over. “In 1544,” he says, “lord Surrey was fieldmarshal of the English army in the expedition to Boulogne, which he took. In that age, love and arms constantly went together; and it was amid the fatigues of this protracted campaign, that he composed his last sonnet, called * The Fansie of a Wearied Lover.” But this is a mere supposition. The poems of Surrey are without dates, and were arranged by their first editor without any attention to a matter of so much importance. The few allusions made to his personal history in these poems are very dark, but in some of them there is a train of reflection which seems to indicate that misfortunes and disappointments had dissipated his Quixotism, and reduced him to the sober and serious tone of a man whose days had been “fevr and evil.” Although he names his productions songs and sonnets, they have less of the properties of either than of the elegiac strain. His scripture- translations appear to be characteristic of his mind and situation in his latter days. What unless a heart almost broken by the unnatural conduct of his friends and family, could have induced the gay and gallant Surrey, the accomplished courtier and soldier, to console himself by translating those passages from Ecclesiastes which treat of the shortness and uncertainty of all human enjoyments, or those Psalms which direct the penitent and the forsaken to the throne of almighty power and grace? Mr. Warton remarks that these translations of Scripture “show him to have been a friend to the reformation;” and this, which is highly probable, may have been one reason why his sufferings were embittered by the neglect, if not the direct hostility of his bigotted father and sister. The translation of the Scriptures into prose was but just tolerated in his time, and to familiarize them by the graces of poetry must have appeared yet more obnoxious to the enemies of the reformation. The translation of the two books of the Eneid is “executed with fidelity, without a prosaic servility; the diction is often poetical, and the versification varied with proper pauses.” Its principal merit, however, is that of being the first specimen in the English language, of blank verse, which was at that time growing fashionable in the Italian poetry. It is very probable that he intended to have translated the whole, and he is so much more elegant and correct in this than in his other translations, that the Eneid appears to have been the production of his happier days. The fidelity which Mr. Warton attributes to the translations from Virgil, our author has not preserved in his translations from Scripture, which are very liberal, and by frequent omissions, and a different arrangement, made to suit his situation and feelings at the time they were written, which was probably when he was in the Tower. 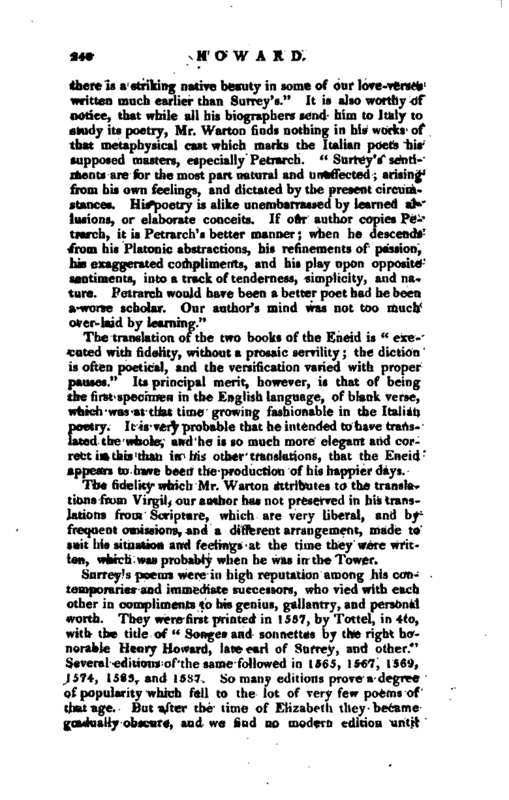 Surrey’s poems were in high reputation among his contemporaries and immediate successors, who vied with each other in compliments to his genius, gallantry, and personal worth. They were first printed in 1557, by Tottel, in 4to, with die title of “Songes and sonnettes by the right honorable Henry Howard, late earl of Surrey, and other.” Several editions of the same followed in 1565, 1567, 1569, 1574, 1585, and 1587. So many editions prove a degree of popularity which fell to the lot of very few poems of that age. 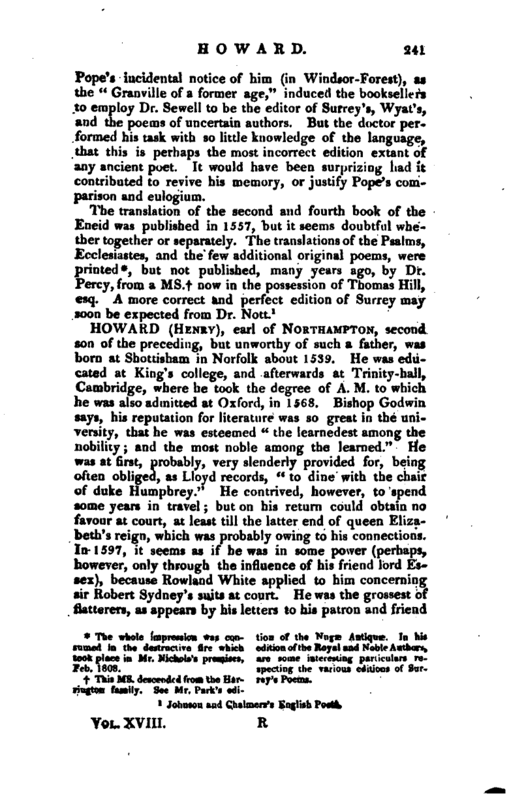 But after the time of Elizabeth they became gradually obscure, and we find no modern edition until | Pope’s incidental notice of him (in Windsor-Forest), as the “Granville of a former age,” induced the booksellers to employ Dr. Sewell to be the editor of Surrey’s, Wyat’s, and the poems of uncertain authors. But the doctor performed his task, with so little knowledge of the language, that this is perhaps the most incorrect edition extant of any ancient poet. It would have been surprizing had it contributed to revive his memory, or justify Pope’s comparison and eulogium. The whole impression was consumed in the destructive fire which took place in Mr. Nichols’s premises, Feb. 1808. Johnson and Chalmers’s English Poets.